Starring: Uma Thurman, Lucy Liu, Vivica A. Fox, Michael Madsen, Daryl Hannah, David Carradine, Sonny Chiba, Chiaki Kuriyama, Gordon Liu, Michael Parks, Bo Svenson, Julie Dreyfus, Michael Bowen, Jun Kunimura, James Parks. “The 4th film by Quentin Tarantino” we are told in big bold lettering, almost as big as the title itself. It has now become an event filled with anticipation when the one time video store clerk releases a film. One thing is for sure though, when entering into his violent world of cool amoral criminals, snappy dialogue and cult music selection, you’re in no doubt when you’re on Tarantino’s territory. Shot in the head and left for dead on her wedding day by her colleagues “The Deadly Viper Assassination Squad”, a former assassin known as ‘The Bride’ (Uma Thurman) wakes from a coma four years later, intent on revenge. She makes a ‘death list’ of the five people involved and number five on her list is former boss and lover Bill (David Carradine), but first she has to go through the others one by one. That pesky Tarantino has gone and done it again. He may well plagiarise but his knowledge of world cinema and the heavy influence it has on his films, in some ways, allows a wider audience to access some wonderful cinematic ideas they normally wouldn’t. He borrows but also betters. The collision of influences this time are Japanese anime, spaghetti westerns, Samurai and Yakuza pics. 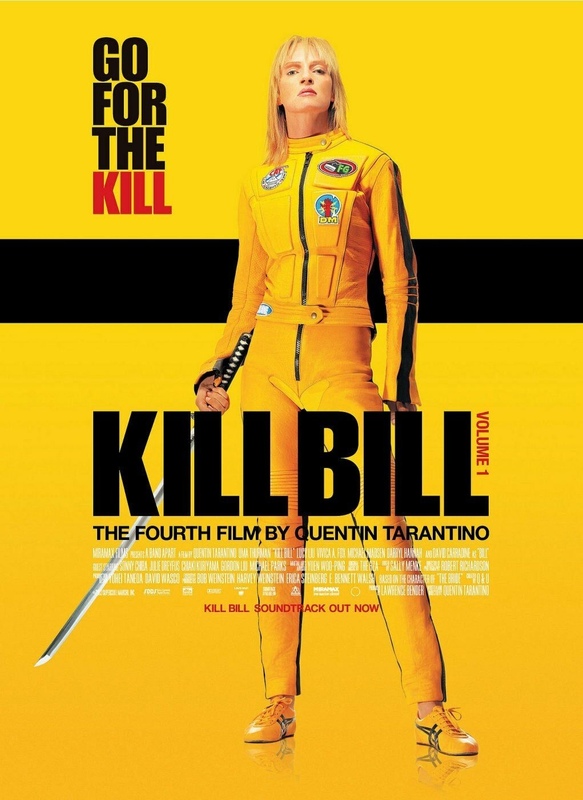 It’s an impressive mash up of genres and Tarantino’s meticulous eye for detail combines them masterfully. Present once again is the same split time frame structure that Tarantino devotees will be accustomed to, with each part of the story told in chapters. His pop-culture references also appear, as does his ‘muse’ Ms. Thurman. She doesn’t really have a lot to do other than slice and dice one or two (hundred) people but Thurman brings a suffering intensity to the role and confirms why Quentin holds her in high regard. This is a bloodletting extravaganza and Tarantino gets a chance to show that he’s a highly capable action director into the bargain. It’s an accomplished piece of filmmaking with the vibrancy and gorgeous cinematography by Robert Richardson deserving a very special mention. None more so than the concluding showdown between Thurman and Lucy Liu’s ferocious O-Ren Ishii at ‘The House Of The Blue Leaves’. 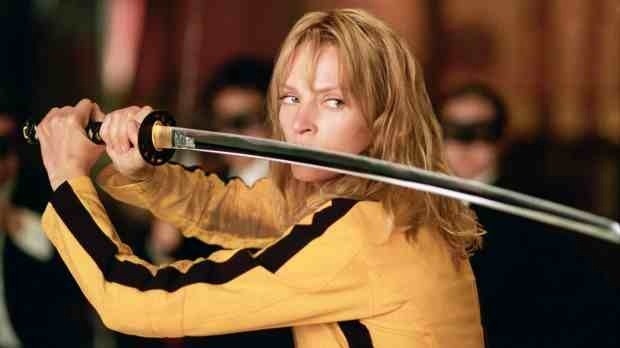 It’s an absolute visual masterclass and must be included as one (in the many) of Tarantino’s finest scenes. It’s simply stunning and a surprisingly serene and composed ending to this frenetic first installment of the story. Highly implausible I hear you say? Of course it is, but it’s also highly enjoyable escapism and Tarantino proves that he can turn his hand to any genre. This entry was posted on January 24, 2012 at 10:41 am and is filed under Action, Crime, thriller with tags 2003. You can follow any responses to this entry through the RSS 2.0 feed. You can leave a response, or trackback from your own site. Great post, I loved the soundtrack to this one. Thanks again Vinnie. Yeah, the soundtrack was amazing as it often is with QT. I recently rewatched this and reviewed it. Thought you’d be interested as you’re a big fan of Tarantino. I noticed in my email, Vinnie. Still working through some posts but I’ll be sure to pop by, man. Cheers!